We’d love your help. Let us know what’s wrong with this preview of A Flair for Chardonnay by Deborah Garner. All four Tremiato siblings When flamboyant senior sleuth Sadie Kramer learns the owner of Cioccolato, her favorite chocolate shop, is in trouble, she heads for the California wine country with a tote-bagged Yorkie and a slew of questions. The fourth generation Tremiato Winery promises answers, but not before a dead body turns up at the vintners’ scheduled Harvest Festival. To ask other readers questions about A Flair for Chardonnay, please sign up. A Flair for Chardonnay by Deborah Garner was an interesting afternoon read for me. The smoothly paced plot with Ms. Garner's descriptive writing introduced Sadie quite well. I found Sadie to be an interesting character who enjoys life and loves to solve mysteries. A Mystery With Flair! A Flair for Chardonnay is the first book in a series that features Sadie Kramer and her sidekick, Coco, a little dog, a Yorkie, who she carries in a little tote bag and is a faithful companion and a very well-behaved one at that. Sadie owns a boutique in San Francisco, right next door to Mateo who is a chocolatier. Sadie does love her chocolates and is not ashamed to admit it. She also has a flair for putting together outfits for her customers of her shop Flair, named for h A Mystery With Flair! 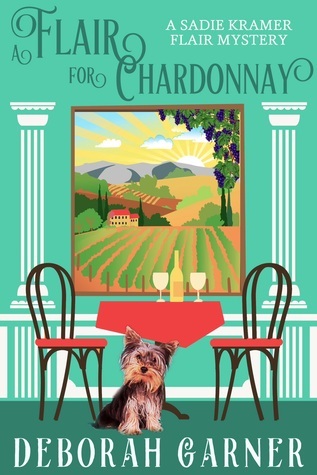 A Flair for Chardonnay is the first book in a series that features Sadie Kramer and her sidekick, Coco, a little dog, a Yorkie, who she carries in a little tote bag and is a faithful companion and a very well-behaved one at that. Sadie owns a boutique in San Francisco, right next door to Mateo who is a chocolatier. Sadie does love her chocolates and is not ashamed to admit it. She also has a flair for putting together outfits for her customers of her shop Flair, named for her love of style and adventure. Mateo and his family own Tremiato Winery in St. Vincent’s Hollow. Even though Mateo is part owner of the winery, his passion is chocolates so he has no part in the daily running of the winery which is a bone of contention to his siblings. They feel he should be assisting in the business. Sadie is concerned about her neighbor after hearing him on the phone arguing with someone so she decides to visit the winery. Her mission is twofold, to find out what may be bothering Mateo and a mini vacation, so she leaves the running of her shop to her trusted employee and off she goes. At the winery she meets the family, they do not know at this point that she is a friend of Mateo's. While she is there though there is a murder on the premises and that is where the mystery begins. The family had been negotiating to sell the winery but Mateo doesn't want to sell so when a dead body turns up, everyone in the family is suspect. With Sadie's skill for detective work, she is determined to find out what happened and why? This is when the story gets interesting, even though Sadie is not a detective, just a concerned and nosy friend, she is able to put the clues together and figure out who the killer is. This is a fun cozy mystery, filled with character and "flair". Written very well with interesting characters and a back story of a seemingly dysfunctional family. Who was the murdered person and why was he killed at the winery and what was his connection to the Tremiato family? Well for these answers you need to read the book! I look forward to reading the next installment in the Sadie Kramer Flair Mystery series. Sadie Kramer believes life should be lived with "FLAIR" -- for style, adventure, for interesting and extravagant flavors, especially specialty chocolates. She has four "C's" to live by and a very special personal fifth "C," Coco, her secret tote bag companion. It is the curiosity "C" that draws Sadie into this present predicament. Responding uninvited to an aggitated, overheard, phone conversation she heads off for an upscale community centered on vineyards and family dynamics overwhelmingly comp Sadie Kramer believes life should be lived with "FLAIR" -- for style, adventure, for interesting and extravagant flavors, especially specialty chocolates. She has four "C's" to live by and a very special personal fifth "C," Coco, her secret tote bag companion. It is the curiosity "C" that draws Sadie into this present predicament. Responding uninvited to an aggitated, overheard, phone conversation she heads off for an upscale community centered on vineyards and family dynamics overwhelmingly complex and confusing. We deliciously get to appreciate an environment many of us will never visit. Now she could just tap questions into a keyboard. Wearing fuzzy slippers and polka dot pajamas, no less! The only flaw I perceived in the plot was insufficient strength of the planted clue. I did have to look back and see the relationship to the crime scene. I like the friendship between Matteo and Sadie and that she's willing to go see his family to try to determine what has him upset. I have to admit to understanding the love of chocolate and the love of good food moreso than the love of wine and the fashion flair aspects of the book. Sometimes the descriptions of the clothes and accessories got a bit tedious for me. It's a wonder Sadie finds time to run her shop--and it's a good thing she has an understanding and capable assistant, because Sadie I like the friendship between Matteo and Sadie and that she's willing to go see his family to try to determine what has him upset. I have to admit to understanding the love of chocolate and the love of good food moreso than the love of wine and the fashion flair aspects of the book. Sometimes the descriptions of the clothes and accessories got a bit tedious for me. It's a wonder Sadie finds time to run her shop--and it's a good thing she has an understanding and capable assistant, because Sadie seems gone from her shop more than she's there in this book. Coco seems to be a cute dog, but I think Sadie overdoes it with carrying her almost everywhere in a tote. I also never figured out if Tina knew Sadie was keeping Coco in the room. I can kind of understand Sadie talking to the dog, but I always feel it is a bit of a stretch when authors start making it seem like animals participate in solving the problems. Stefano shook free of Detective Hudson and backed off, turning to Sadie. "How did you know?" Thereby, committing an unforgiveable faux pas - exchanging character's names. And giving a big red mark to Elizabeth Christy, who edited the book. Sadie Kramer is a complete hoot! She has a nose for solving a mystery. The book is well-written, without the usual little typographical errors I find in many of these type of books, and the ending came as somewhat of a surprise, although the hints pointing at the guilty party were certainly there once I thought about it in retrospect. Definitely a good read. I like the main character, Sadie, although she needed to be "fleshed out" more. I know she's flamboyant in her style and col o r choices, but I learned nothing about her as a person, specifically. All the businesses in the wine country became a little confusing since each had same or very similar words in their names. It wasn't an exciting story that I couldnt put d o wn, but worth reading. What a fun book! I love the heroine of this book Sadie, and her little Yorkie Coco. She's classy and super clever to be able to work out the intricacies of this puzzling case. This is a light hearted crime story with many descriptions of her clothes and accessories and the different food, wine and chocolates she eats in the course of the puzzle. In the end though, Sadie gets her killer and that's all that matters! This is the first in the series and the first time reading this author. The main character is Sadie who owns a little boutique next door to Matteo . Now Matteo owns a fancy handmade chocolate shop but his family owns a winery. When Sadie hears there is trouble up at the winery she heads up there to see if she can helps and ends up trying to solve a murder. She is quite the characte but she does figure it ou and boy I didn't see that ending. Look forward to more of he adventures. So dull and uninteresting, couldn’t get past chapter ten. No character development beyond how much chocolate Sadie eats and weak plot development. It is never explained how it is that Sadie is a go-to for solving crimes, let alone why she took it upon herself to invade her friend’s family business. Cozy mysteries are meant to be fun and entertaining, not filled with realism or human drama, but this one falls way short of the mark. What a scrumptious way to solve any mystery, Sadie enjoys food any food and next to it a mystery. An enjoyable mystery with flair to be read at any time of the day or evening,ending with a few recipes at the end of the book. What more could you ask for in a cozey mystery? I wanted a light read; a fun book with which to start my summer. This was it. A good mystery which I didn’t figure out with interesting characters. I could see this series becoming a hallmark mystery series. Living in the Bay Area, so near the Napa wine country, and in the Livermore Valley wine country, I enjoyed the winery setting. While mysteries may not usually be considered fun, I found A Flair for Chardonnay to be a light "cozy" book with no blood and gore. I enjoyed Sadie's sleuthing abilities as well as her love of all things chocolate. I will certainly be reading more of Deborah Garners books. What a book! Delightful. Best book I have read lately. I love a good cozy mystery and this one did not disappoint me. Ah, such Flair. I want to wrap a scarf around my neck and flounce! Give me more Chocolate! This story line has definite problems especially in the impossible ending. The characterization is also flat with surface personalities. No depth, no real excitement, and no recommendation. A first in a series I am sure I’ll pursue. A fun little read. A few twists a turns along the way, I definitely did not have it figured out. Nice surprise ending. A winery, a murder and a very smart lady who has to stick with sleuthing it for the sake of her friendship with another businessman. Interesting characters, good plot. I enjoyed this book alot. It was engaging and held my attention as it moved from one scene to another. Sadie our sleuth was very likeable and who can not love little Coco her dog! If you are looking for a great read pick this one up! Sadie is concerned about her friend, Matteo, and his family's wine business. She goes to the winery and meets his mother and siblings. The next day a body is discovered at the winery and Sadie starts investigating. It was a most enjoyable "tidbit" of suspense and "wine country" culture. Sadie is a kick and Coco is a sweetie. Fast moving...now I must go and make some cream puffs. A fun adventure following mature sleuth and fashionista Sadie into wine country to solve a murder. The cast of supporting characters were well fleshed out and made the story come alive. Definitely recommend for fans of cozy mysteries. Instead of being sure who done it, this book keeps you guessing! As the first book in the Sadie Kramer Flair Series, it does a good job setting up an interesting series. A 3 times divorced lady with a Yorkie for a companion, a passion for flair in all things, has a tendency to get involved in solving murder cases. A fun read. I enjoyed this hugely. I always enjoy books where I learn a little something about an industry. Sadie is a great character, though I think the story ended a little quick. I enjoyed this book and the character's very descriptive love of food. I'm looking forward to reading more books written by Deborah Garner. Entertaining! I like the twists so the real killer is a surprise.